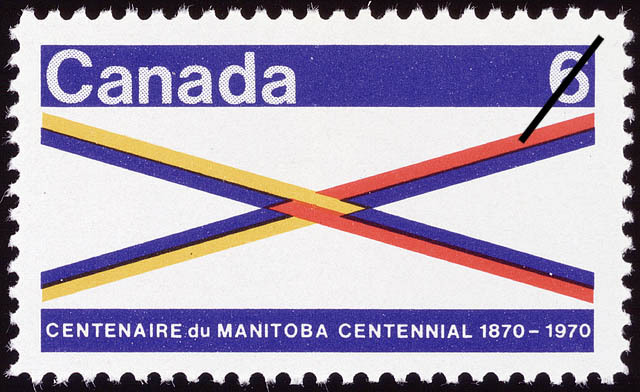 The value of a Manitoba Centennial, 1870-1970 - 6 cents 1970 stamp depends on several factors such as quality and wear, supply and demand, rarity, finish and more. Values in the section are based on the market, trends, auctions and recognized books, publications and catalogs. This section also includes information on errors and varieties and characteristics. Manitoba, the first province to enter Confederation after the original 4 in 1867, occupies a central geographic position justifying the term of Keystone Province. It was Lord Dufferin who predicted that Manitoba is destined to be the keystone of a mighty arch of sister provinces stretching from the Atlantic to the Pacific. When it was created in 1870, Manitoba, by reason of its small area, quickly acquired the affectionate title of the postage stamp province. Subsequent extensions of its boundaries, principally by Acts in 1881 and 1912, created today's province of 251,000 square miles extending some 761 miles northward from the international border. Although centrally located in the breadth of North America it has a 400 mile coastline on Hudson Bay with docking facilities at Churchill. The concept of Manitoba as a Prairie Province is questionable when statistical information reveals that 40,000 square miles of fresh water and 123,000 square miles of forest land jointly comprise nearly 65% of the province's total. Of the 100,000 lakes in Manitoba, there are 38,500 that are 80 acres or more in area.